So, if you really want AWD and need that 3rd row in a compact SUV, make it a point to test drive these two Best Small AWD SUVs with 3rd Row. Actually, we just bought the “best small AWD SUV with a 3rd row”…and it was none of the above! 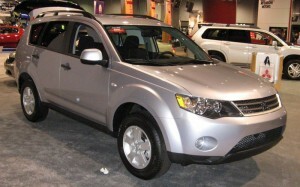 It was a 2011 KIA Sorento SX, which came out in January 2010 (as a 2011 model) and rapidly became the 3rd hottest selling SUV in the USA. Ours is a 2011 KIA Sorento SX, and literally caused everyones jaws to drop…outsold everything except the RAV4 and Ford Escape…and sold 15,000 in Feb ’11 alone! And it has a rear 3rd row seat, not a pretend “hammock” like the Mitsu has. And the SX has close to a luxury SUV level of ammenities, leather, navigation, keyless entry/engine start, glass roof, chrome alloys, LED tail lights, most powerful all aluminum V6 in the class (276 hp! ), 6 speed automatic and so on! Terrific SUV..we love ours. By all means test drive and research before buying. The icing on the cake of course, is the 100,000 mile 10 year warranty on engine and drive line!